Star Wars Battlefront will let you tour the blaster-scarred beaches of Star Wars: Rogue One's planet Scarif before you see the movie. 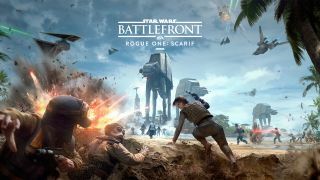 EA announced today that the game's fourth and final planned DLC expansion, Rogue One: Scarif, will be released to Season Pass owners on December 6, nine days before the film debuts in the UK on December 15 (and 10 days before its US opening on December 16). Rogue One: Scarif will add Rebel sergeant Jyn Erso and death trooper commander Orson Krennic to Battlefront as playable hero characters. It will also feature four maps inspired by the film (including that Normandy-esque beach assault scene from the trailers) and a "multi-stage game mode with space and ground combat". On top of the above art showing Erso about to charge into battle against Krennic, EA also snuck a couple scenes from the new DLC into this trailer for Star Wars Battlefront: Ultimate Edition. Here, I've pulled them out into gif form so you don't have to keep rewinding. If you're playing on PS4, you'll also get access to the Star Wars Battlefront Rogue One: X-wing VR Mission on December 6.